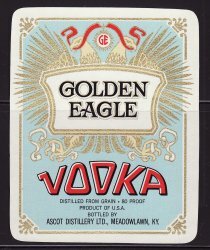 Golden Eagle Brand Vodka Label. Vintage, original Golden Eagle Vodka Label. Bottled by Ascot Distillery Ltd. Meadowland, Kentucky. This mint original label from the 1940s measures 3.5x2.75". Image of golden eagles and the Golden Eagle brand in gilding. Shipped flat in a sturdy envelope. Ready to frame.